Most of the station site has been cleared with a housing access road running along the trackbed. The main station building and a short section of platform survives, split into two private residences. Notes: When Saffron Walden station opened on 23 November 1865 it was a terminus as the extension to Bartlow was not yet ready. This opened on 26 October 1866 and on this day Saffron Walden became a through station. There was a single 202ft platform on the down side of the line. There was a white brick, unusually large two-storey, 'H' shaped building with a pitched slate roof. The building was bigger than usually provided for a town the size of Saffron Walden and included the booking office, general and ladies' waiting rooms and toilets. The stationmaster had his office in a separate external building between the main building and the signal box. The upper floor of the main building was accommodation for the stationmaster. There was a small canopy over the station entrance for the benefit of arriving passengers in bad weather. On the platform side there was a slightly upward sloping canopy supported on cast iron columns stretching the full width of the platform. The station was initially gas-lit but electric lighting was installed by the LNER. Freight facilities were extensive and included a number of private sidings. Opposite the platform there was a run-round loop from which a long siding ran under South Road bridge to the Gas House siding and Anglo American Oil Company's tanks. From this siding there were an engine shed, coal stage and turntable and two sidings serving the railway foundry. There was also a single-road carriage shed, but this was taken out of date at an early date as it was considered surplus to requirements; it was quickly demolished. The engine shed was opened on 22 October 1866 and was formally closed in July 1958 upon dieselisation of branch passenger services by 4-wheel railbuses. However, a small diesel shunter was stationed at Saffron Walden and between duties this rested in the shed. The goods yard was to the west of the station; it had facilities on both sides of the line. On the up side the 637ft-long Dixie's siding which had a loading dock with a 1 ton 10 cwt capacity crane at the east end. Road entrance to the dock was from Debden Road. The down side goods yard had a loop siding reached from both directions which passed thorough a large brick goods shed with a second 1 ton 10cwt capacity crane. Cattle pens and a dock were sited between the shed and the station. There were coal bins to the west of the shed and two short sidings at right angles with wagon turntables for access. Road access was from Station Road where there was a weighbridge. Access to the sidings was controlled by a 32-lever signal box at the west end of the platform. Water cranes were sited at the east end of the platform and on the shed road; these were served by a tank on a brick base adjacent to the shed. The yard was able to handle up to 112 wagons. The station closed to passengers on 7 September 1964 but the goods yard remained open for another 2½ months, closing with the line on 28 December 1964. Although proposals to reopen the station never came to anything; from 17 September 2013 it was once again possible to by a railway ticket at Saffron Walden to Audley End and other stations on the national rail network. Rail operator Greater Anglia has teamed up with bus companies and Essex County Council for the scheme – which allows people to buy a combined bus and train ticket online or from Saffron Walden Tourist Information Centre. In 1835 Saffron Walden was surveyed as part of the London to Cambridge railway line and hopes for its future prosperity were raised. Unfortunately the intervention of Lord Braybrooke made the siting of a station in Saffron Walden impossible, and a new station was constructed two miles from the town at Audley End. It was soon apparent to the town council that they needed a railway connection to arrest the economic depression which had descended on the town. A public meeting was held in 1860, and a proposal was put to the Eastern Counties Railway for a branch from Audley End to Saffron Walden. Sufficient local finance was soon forthcoming, and a Bill was put before Parliament on 14 November 1860 with the Saffron Walden Railway Act receiving Royal Assent on 22 July 1861. Even before the first sod was cut, there was a proposal, unpopular with some directors, to extend the line northwards to a junction with the recently authorised Eastern Counties Shelford - Sudbury (Stour Valley) line at Bartlow. 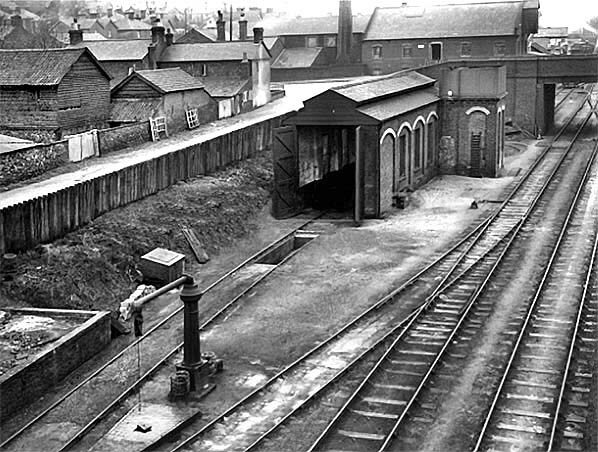 Construction of the Saffron Walden branch started on 18 May 1863, and on 2 June 1863 the Saffron Walden Railway Extension Act received Royal Assent. The construction of the line was virtually trouble-free and, after passing a Board of Trade inspection on 18 November 1865, the branch to Saffron Walden opened five days later. The extension to Bartlow, although running through a much hillier terrain requiring cuttings and embankments, was completed 11 months later opening on 26 October 1866. From the outset the line was beset with problems. Passenger numbers were disappointing, not helped when the state of the track required a 10 mph speed limit to be introduced. To avoid insolvency the Saffron Walden Railway Company eventually sold out to the Great Eastern on 1 January 1877. The new ownership brought changes, with a through service to London being introduced in an attempt to increase passenger revenue, Goods traffic handled at Saffron Walden yards was increasing steadily each year. WW1 brought added prosperity; although the line was now under government control, the pre-war passenger timetable was retained, and goods traffic flourished as home grown produce was dispatched to towns and cities to make up for the loss of imported food. The countryside around Saffron Walden was also used for troop training which brought added traffic to the branch. After the war the 1919 General Railway Strike led to a decline in railway freight with local farmers turning to the improving road transport. Passenger numbers remained healthy, however, as few local people owned cars. On 1 January 1923 the GER was absorbed into the London & North Eastern Railway. Initially there were few changes, but a railway strike in 1924 brought a decline in use of the branch with passengers turning to road transport. The 1926 General Strike brought a further decline in freight traffic from which the branch was never to recover. Passenger receipts began to pick up in the mid 1930s when holidays and rambles in the country became popular. Shortly after the start of WW2 the branch began carrying evacuees from London, and with petrol rationing curtailing road transport the line began to prosper with most trains running full. After the war the service began to deteriorate with freight traffic in decline once again following the lifting of petrol rationing. 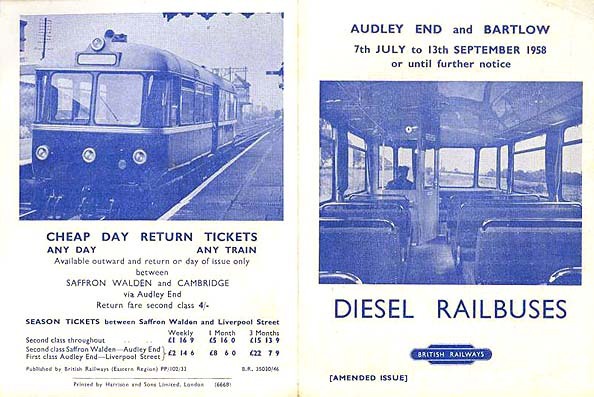 By the early 1950s the increase in car ownership led to a dramatic loss in passenger revenue, but as several of the surrounding lines closed the Saffron Walden branch survived and, as part of the 1955 BR Modernisation Plan, diesel railbuses were introduced on 7 July 1958. Despite their success the line was listed for closure in the 1963 ‘Beeching Report’; and despite a spirited local attempt to keep the line open the passenger service was withdrawn from 7 September 1964. Within a month of closure, BR announced their intention to withdraw freight facilities from 28 December 1964. The junction at Audley End was severed by June 1965 and the majority of the track was lifted during the summer of 1968. A short section at Bartlow was retained, and this was used during the making of the film Virgin Soldiers. The last section of track was finally removed when the Stour Valley line was lifted in 1970. Tickets from Michael Stewart except 1821 Brian Halford. Route map drawn by Alan Young. Bradshaw from Nick Catford. 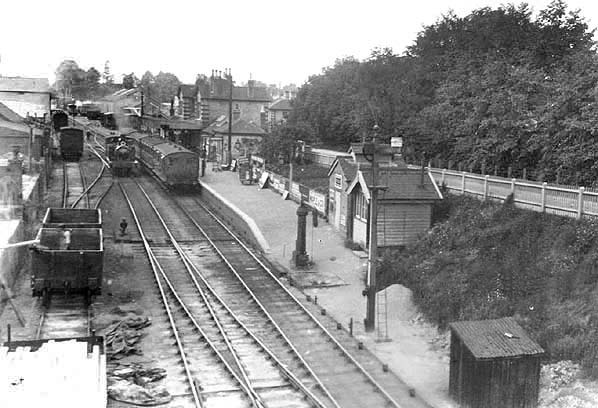 Looking south-west towards Saffron Walden station before April 1917. A locomotive is seen running round its coaches. 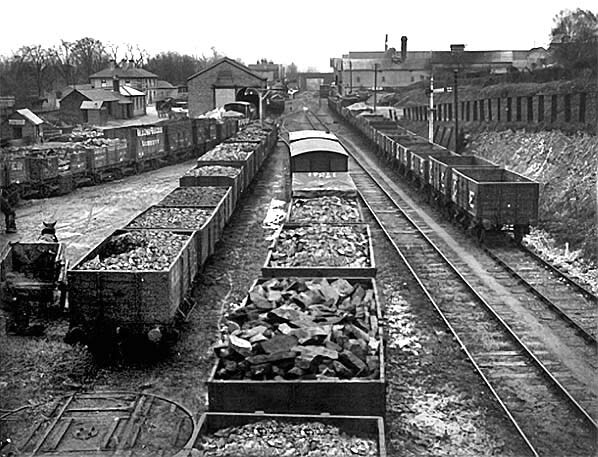 A number of wagons are seen in foundry siding on the left. 1887 1:2,500 OS map shows the extensive area covered by the station, goods yard and engine shed. Debden Road is seen bottom left with South Road crossing the line right of centre. The goods yard starts immediately east of Debden Road and the engine shed is east of South Road. A crane is identified to the west of the goods shed; this does not appear on later maps and photographic evidence shows the crane has been moved to the east end of the goods dock to the south of the line. end-on to the cattle dock. 1897 1:2,500 OS map shows little has changed apart from an additional siding running diagonally across the yard to the west of the goods shed, this served the coal yard to the north of the siding. At a later date a second parallel siding was added. There has been some residential development to the south of the line. 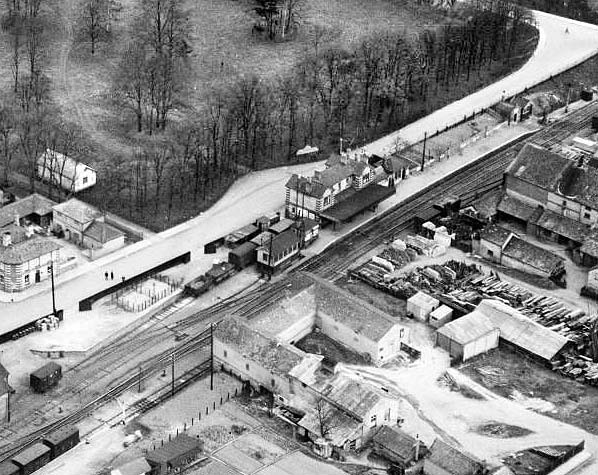 Aerial view of Saffron Walden station in April 1929. The 32-lever signal box is seen at the east end of the platform. The siding running behind the signal box served the cattle dock which is seen on the left complete with livestock pens. The angled section in the left was originally an end dock with a single wagon siding accessed from a wagon turntable end on to it. (see Town Plan above). A cattle market was established in the town in 1834. Dixie's siding is seen bottom left with a number of box wagons standing in the dock. The foundry siding is opposite the station building. 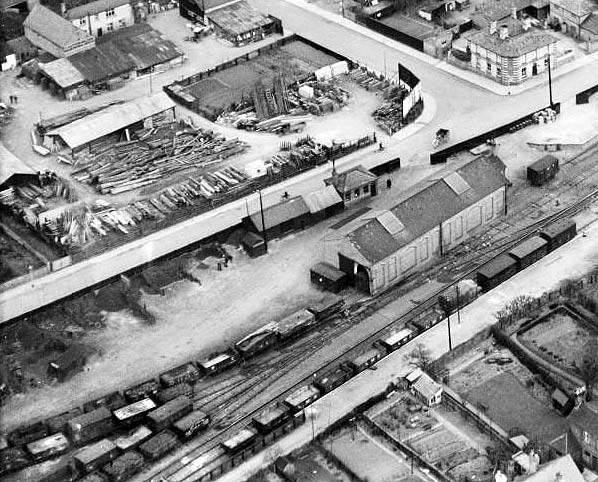 Another section of the 1929 aerial photograph showing the goods shed and goods office in the centre; the coal yard is seen on the left. The second goods dock, alongside Dixie's siding, is seen at the bottom. The ‘Railway Arms’ public house is seen top right at the junction of Station Road and Station Street; it is the only building in this view and the view above that is extant. What was once an industrial area is now entirely residential. Reproduced with the kind permission of Simmons Aerofilms Ltd.